Smoo Cave is a unique and magnificent sea cave that merges with a freshwater cave complex to create an underground haven that every tourist will find impressive. The grand entrance to the cave has been enlarged by corrosion to a massive 40 metres wide and 15 metres high, making it the UK’s largest cave entrance by far. There’s also a walkway that leads to a side entrance to the secondary cave where a 20-metre high waterfall pours down majestically. An estimated 40,000 people visit this mystic cave annually, making it one of the most popular attractions in the Scottish Highlands. Although extensive corrosion has already carved out a gaping entrance, nowadays seawater typically only enters the cave during the spring tides. Archaeological artefacts dating back to the Iron, Norse, and Neolithic ages indicate that the cave system may have been in use by humans as far back as the Mesolithic age. Given its historical importance, it has been classified as a protected scheduled monument. The name “Smoo” is said to have originated from the Norse word “smuga” which meant “hiding place” or “hole.” While it’s unclear whether the cave was involved in ancient battles, with the name’s meaning in mind, it’s tempting to imagine and assume that Norse warriors once used it as a strategic place of refuge during intense battles. The cave is open to the public year-round, but storms and high tides can rarely affect accessibility, so it’s best to check the weather in advance as a precaution. Guided tours are available during the summer and spring months, bringing tourists to the second chamber and waterfall via boat ride. Although it’s possible to visit in the winter, you should obviously expect a colder and less welcoming experience, and some areas of the cave may be closed off after excessive rain or snowfall. 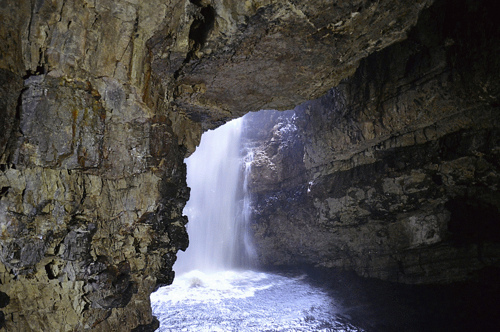 It should be noted that since Smoo Cave is considered active, tour availability is at the mercy of weather conditions and the water levels of the Allt Smoo stream which empties as a waterfall into the inner chamber of the cave. The most popular alternative attractions near Smoo Cave include Durness Beach, John Lennon Memorial Garden, Rispond Beach, Balnakeil Beach and Bay, Ben Stack, and the Golden Eagle Zip Lines, the latter of which is home to some of Scotland’s best zip wire experiences along the illustrious 500 route of the North Coast. There are also a handful of fine dining establishments within a few kilometres of the cave entrance, so you won’t be too far from a good meal once you’ve worked up an appetite. The Smoo Cave car park and toilet facilities are located approximately one mile to the east of the Durness Tourist Information Centre. After exiting your vehicle you can follow A838 towards Tongue for about a half mile on foot to find signs that point to the cave’s entrance. It should be noted that the path and steps leading to the cave are rather steep, so be sure to bring appropriate footwear for hiking and cave exploration.